If you’ve read the Hands Free Mama blog, you get the idea of being “hands free”. Put down your phone and free your hands for your child. The idea of spending quality time with your children isn’t new—Cat Stevens has been singing about it since 1974 (Cat in the Cradle)—but the timing is paramount. So much is vying for our attention nowadays: Facebook, Netflix, cell phone games, texting, email, etc. Where does that leave our kids and loved ones? My first exposure to Rachel Macy Stafford was from a Huffington Post article entitled, “6 Words You Should Say Today”. The same article appears on her blog and in her book, but the importance of it remains—it’s not about being the best, it’s about loving the time spent together. 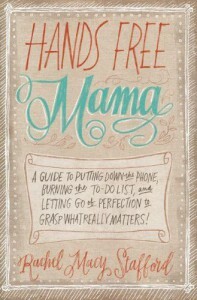 The book HANDS FREE MAMA is crafted as a journal used to help the reader go “hands free”. Much like her blog, there are bits of advice followed by large sections of personal stories, usually followed by poem-like repeated mantras. While inspiring, the ideas seem similar throughout. You may be just as well served sticking to her blog (but isn’t that anti-hands free)? And that’s my one contention with going hands free: to what point? People reading this book or reading her blog may be inspired to totally do away with all technology forever. While that may be a good thing, it may not be for everyone. The book is gung-ho about spending time with your kids, but talks nothing about balancing it out. Overall, my life and my kids’ lives have benefited from this book and the author’s blog. 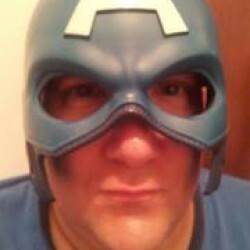 I would also say that my wife, my friends’, and my co-workers’ lives have benefited as well. When we go hands free, we reestablish the connections that bring about more productive and happier lives. And while the book is much of the same from the blog, I still give it five stars for the heart of its matter. I would like to thank Zondervan for providing me with a review copy of this book; this review is my own and has not been influenced by receiving a review copy.